As a full service bar, Sutter Station Tavern provides a wide variety of well, call, and top shelf spirits. We also serve red and white wines and have plenty of popular beers on tap and different bottles to choose from. Check out below for just some of what we regularly serve and some favorite items from our drink menu. Kentucky Mule ~ Whiskey, ginger beer, lime juice. Add Strawberry, Blueberry, or Mango for a wonderful flavor! Moscow Mule ~ Vodka, ginger beer, lime juice. Add Strawberry, Blueberry, or Mango for a wonderful flavor! Margarita ~ Tequila, fresh lime juice, sweet-n-sour, triple sec, and your choice of Strawberry, Blueberry, or Mango! Whether it’s your next company party or you want to book our bar for your own personal event, Sutter Station Tavern is the place! Aside from our full service bar, we’ve got two pool tables, along with an AMI Internet Jukebox and several TVs for your enjoyment. There’s plenty of seating at the bar or at one of our many tables. We’ve even got a nice, cozy fireplace with its own dedicated table. Located in the middle of San Francisco’s Financial District, Sutter Station Tavern invites you in to come on in and enjoy yourself. 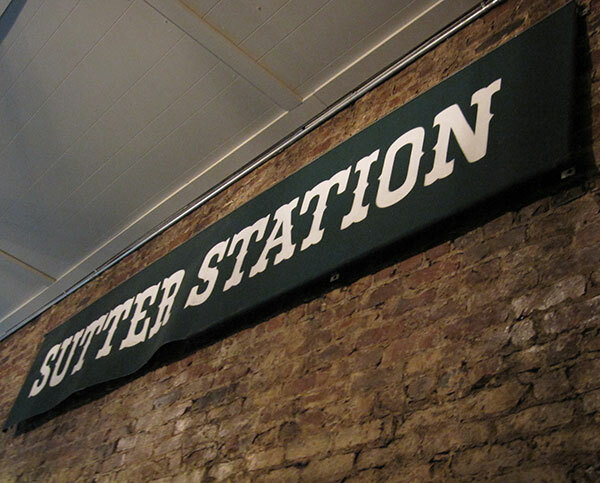 Serving San Francisco in this same location for over forty years, Sutter Station Tavern is a staple of San Francisco.